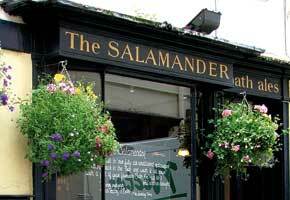 Great choice of Pubs and beers in Bath, certainly many hours spent in the Salamander supping Barnstomer. Did you see the Cheese speciality shop nearby? I know you were following Twitter instructions, but one classic pub in Bath that really is not to be missed is the Star on The Vineyards. The Old Green Tree is also on CAMRA's National Inventory of Historic Pub Interiors. I was checking on your progress throughout the day; not only illustrates how bloody good we beer guys are at making sure we all get to The Good Stuff, it's Twitter at its most powerful. Really like the short time I've spent in Bath, but never managed to get to a pub there (can you really ever love somewhere without trying the pubs?!). Will try to find a weekend to go this year.